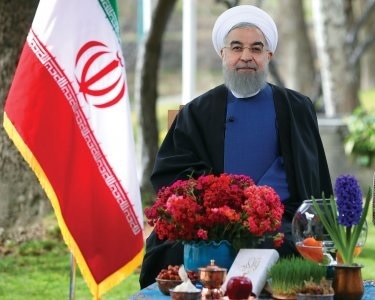 On the Persian New Year, Nowruz, Iran’s supreme leader and president gave conflicting assessments about Iran’s economy. Supreme Leader Ayatollah Ali Khamenei said that the middle and lower classes had suffered during the year from unemployment and high prices. He added that, despite the government’s efforts, “There is a large gap between what has been carried out” and what people expect. In both his March 20 statement and a March 21 speech, Khamenei renewed his call for a “resistance economy” to increase domestic production and create jobs, putting pressure on President Rouhani ahead of the May presidential election. Khamenei has emphasized self-sufficiency as key to economic prosperity whereas President Rouhani has worked hard to increase international trade and investment. Khamenei told pilgrims in Mashhad that he was anticipating an “inclusive and vibrant” election. He said the results should be respected and that he would not intervene unless some act to undermine the process. Bitter & difficult events were mostly about people’s economic & income problems. Middle & lower classes suffered & still suffer from woes. In contrast, Rouhani gave a much more favorable review of the economy in his nationally televised address on March 20. “What we achieved in last year in harnessing inflation and achieving economic growth and employment, was second to none in 25 years.” He acknowledged shortcomings of his government on youth unemployment and wages but was optimistic that the coming new year will be one of “progress and development.” The full text of both speeches are below. “I will touch both of these issues; currently, economic issues constitute priorities for the nation and the country, not for the time being, but it had been so for years; the need to strict planning had been the most felt need; it is a priority for us, but it is also so for the enemies; they resort to economic pressures in order to subdue the country in line with their own interests. “In an active and growing economy, innovative young talents would find channels to be flourished; in a working economy, stagnant money would contribute to the wealth of the country. “Unemployment contributes negatively to social evils; a working economy could attract channel energies of the youth to healthy activities; these are only summary of what production may contribute to national economy; we are potentials to achieve production; some are to be obtained; a successful production could easily achieved by active population in age of labor; university graduates are wealth of the nation. Iran produced engineers more than any country; assets are also available; the government had succeeded in establishing of a National Development Fund, which would reserve oil money, however a percentage of that, to contribute to the public reserve; by now, it should have reserve a lump sum, which would free the country from the yolk of oil, on which the country is so heavily dependent, the price of which is set by the super powers." I congratulate the auspicious Nowruz festival to the great Iranian nation, Iranians residing outside of the country, and all nations of the region that celebrate Nowruz, to the families of martyrs, wounded war veterans, prisoners of war and all veterans, especially to those who are serving the Iranian nation in the society, borders, and healthcare and relief services instead of being at home with their families. This year we have a year full of blessings because it is concurrent with the birthday of H.H. Fatima al-Zahra (AS) and heavenly and divine blessings. God-willing, we will follow the path of unity and empathy and efforts for our country’s pride. The message of Nowruz for us is letting grudges go. The message of Nowruz for us is the message of prosperity and liveliness. In this year that we have elections coming, we need to learn the necessary lessons of Nowruz and nature more than ever. Year 1395 was the year of both implementing “Resistive Economy; Action and Deed” and the implementation of nuclear agreement; and these two had a positive role and effect for us. I deem it necessary to appreciate the dear farmers for their efforts in increasing agricultural products and contributing to wheat self-sufficiency. I also thank workers and industrialists for the considerable growth in industrial production, increasing production of some products to two times more than last year. In this year, with the help of banks, 24000 industrial units were activated. I thank the oil industry engineers and workers for their extraordinary efforts in doubling oil and gas condensate production. We were able to reclaim our rights and regain our position in the oil market with oil diplomacy and efforts of you engineers and workers. It was because of these efforts that we achieved the 8-percent economic growth rate for the first time after the 20-year outlook document announced by the Supreme Leader. I deem it necessary to thank doctors and nurses for taking medical services to the outskirts of towns and rural areas; and this is why our people are being treated in hospitals with less cost than before. I also want to thank teachers, professors and the educated for making us proud among all developed countries. I see it necessary to appreciate athletes and artists for bringing us international and domestic honours and national pride. I also want to thank our dear women, one of whom won a medal in the Olympics for the first time. All of these brought happiness for our dear people in year 1395. Of course, we had some bitter incidents and shortcomings in 1395: the train incident, Plasco building fire, dust in some provinces, floods and other issues for our dear people. We also lost Ayatollah Hashemi Rafsanjani who was the longstanding companion to the Revolution. The new year will be the year of progress and development for our dear nation. The new year will be the year of more employment for our youths. We need to carry out more efforts to compensate for the shortcomings. What we achieved in last year in harnessing inflation and achieving economic growth and employment, was second to none in 25 years. We need to continue the decreasing trend of inflation and the growing trend of economic growth. We could increase wages and salaries of workers and employees to more than the inflation rate and this means that our people can have more welfare. Both in year 1395 and year 1394 our non-oil exports were more than our imports. Therefore, we need to say bravo to all entrepreneurs and exporters for making our nation proud. In the new year, people should be able to use the cyberspace for acquiring knowledge, science, information and promoting their business. This was one of the efforts of the 11th government and we will continue along this path. The cyberspace must be as secure place for our people and we are seeking to eliminate the security atmosphere in cultural and social fields, replacing it with brotherhood, friendship and kindness. During last year, the Charter of Citizens’ Rights was published as it was promised before. This year, we will implement and put the charter in operation. Everybody should know that the nation and people are the owners of the country. Everybody should know that if anyone violates citizens’ rights, they will pay the price. The new year will be the year of development of transportation, in railroads in five provinces, in our fleet of airliners, maritime transportation, and transit with different countries. In the new year, we have two important elections ahead of us. We all must try to have a more active role and presence. We must turn out in large in healthy and legal elections. In the previous elections, there were times that we had moral shortcomings and we need to compensate for the shortcomings. The difference between elections in the Islamic Republic of Iran and other countries must be in the field of moralities and proper social atmosphere. God-willing we will join hands and have very good elections. I hope our dear country be safe in the current year and coming years; I hope our dear and proud people of Iran live their lives with more unity and economic prosperity.